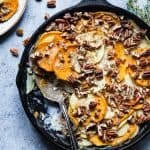 This Healthy Scalloped Sweet Potatoes Casserole is so rich and creamy, you will never believe it’s gluten free and paleo/vegan/whole30 compliant! Perfect for a healthy Thanksgiving! RIDICULOUSLY luscious carby heaven comin’ at your turkey-day-food loving face today. SRSLY internet friends. The creaminess of these easy scalloped sweet potatoes. that are WITHOUT CHEESE. is borderline-insane-off-the-charts-can’t-believe-its-a-real-thing-in-life. But, totally NOT mad about it ONE LITTLE BIT. We came FULL force in this impromptu thanksgiving-sides week with Moroccan simple gluten free stuffing. IE. CARBS. Yesterday, we tool a little low-carb-detour with some cauliflower mashed potatoes. There will A-L-S-O be some more low carb-food coming at you Thursday and Friday (spoiler alert: they’re SO GOOD.) But, today? SWEET POTATO scalloped potatoes are THE THING to eat. 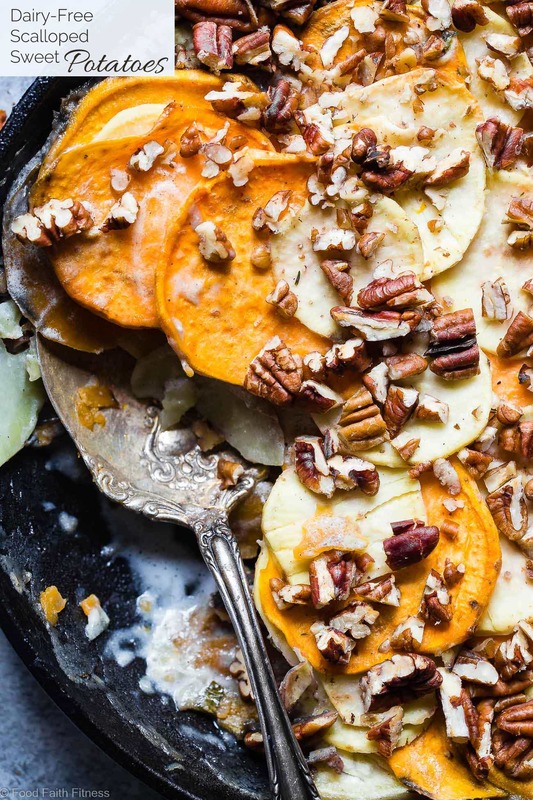 The KEY-KEY-KEY to making a mean healthy scalloped sweet potatoes casserole is THIN sweet potatoes. Thick potatoes = biting into raw, undercooked carb BADNESS and will not end in a happy turkey-day-dinner experience for you. See also: UNIFORMLY thin potatoes to avoid any happy-bliss-bites and then – SURPRISE- raw sweet potato yucky bite. Use a mandolin friends. It’ll save you SOMUCH time. Will also save your muscles. 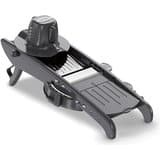 Have you tried cutting a potato into razor-thin slices? NO EASY FEAT. USUALLY you would make super rich and creamy C-H-E-E-SE sauce. But this little pile of layers upon layers of tender vegan scalloped sweet potatoes nirvana? NO CHEESE. Bring some coconut milk and almond milk to a boil, and thicken it up with a little tapioca starch. A little bit of dairy free cream cheese also helps too. But, if you’re not feeling the “cream cheese” you can totally OMIT it and these potatoes? STILL BOMB. You’re gonna <3 <3 <3 the way the little bursts of cozy nutmeg bring out the earthy goodness of the potatoes, and the spice plays with their natural sweetness. 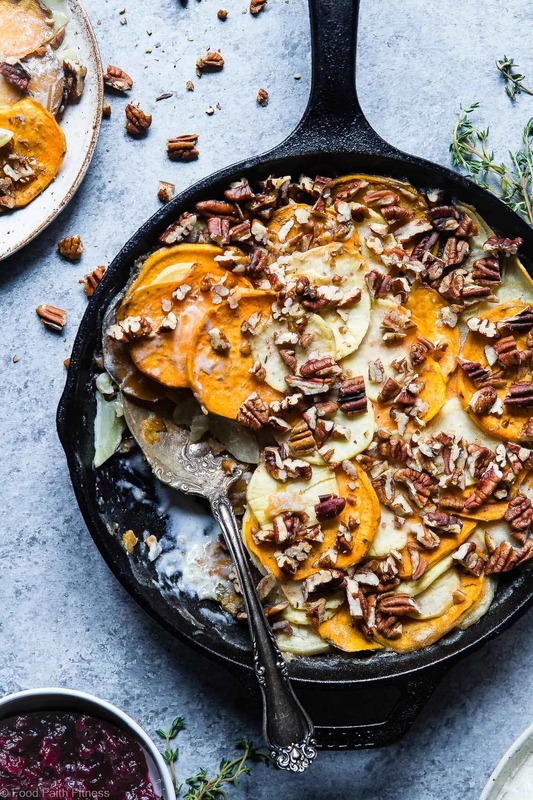 Fresh thyme makes our ooey-gooey potato friends SCREAM fall-food as you munch through every single stupidly-creamy-yet-dairy-free bite of this healthy sweet potatoes casserole. Just when you think it can’t get any better, the RICH and FLAVORFUL roasted garlic flavors swirl across your tongue, mingling with all the natural sweetness and spiciness and your mission-to-create-the-best-thanksigving-side-dish-that-you-didn’t-even-know-you-had is complEAT. Write it down on your “to do” list, JUST so you can check it off. <– Am I the only one that does this? Once I wrote down “breathe.” I felt VRY VRY accomplished that day. You can cook your coconut milk sauce in a HYOOGE pot (liiiike, REAL REAL BIG) and then stir your thinly-slices potatoes right on in until they’re all coated in gooey love and deliciousness. Pop that bad-boy RIGHT into the oven and let it bubble away. 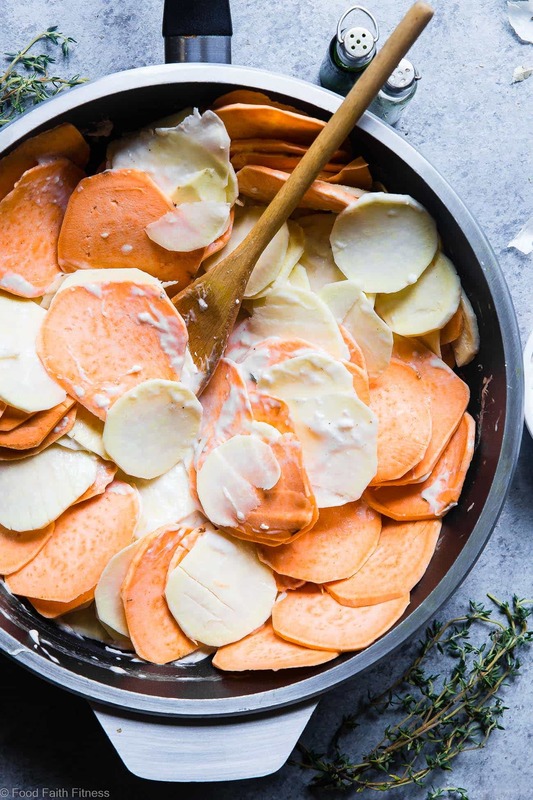 You can make this a healthy scalloped sweet potatoes casserole by layering half the sliced potatoes in a casserole dish, adding half the sauce, and repEAT. Oven –> Bubbly YUM TIME –> DONE. Whatever way you choose, do NOT forget the “crowning crunch” of nutty pecans. Just when your tongue gets through all the tender layers of creamy sweet potato and begins searching for a little something MORE, your taste buds get punched SQUARE in their face (??) with roasty-toasty CRISPY-CRUNCHY pecans. Scoop up a second helping and put on those stretchy pants because you and I? 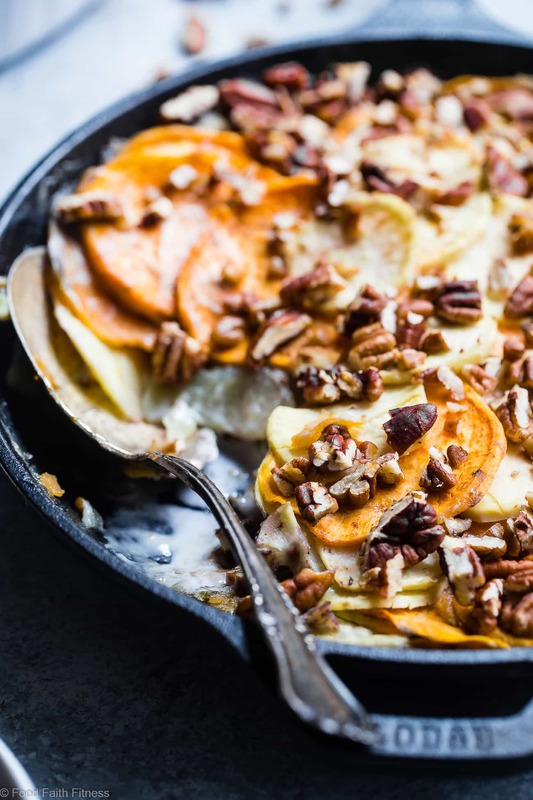 This Healthy Scalloped Sweet Potatoes Casserole is so rich and creamy, you will never believe it's gluten free and paleo/vegan/whole30 compliant! Cut the top of the garlic off, so that the tips of each clove is exposed. Peel of any of the large pieces of papery skin. Drizzle the head with a little bit of olive oil and rub it in. Wrap the tinfoil up like a packet and place into the oven. Cook until the garlic is tender, about 45 minutes. Add 1 Cup of coconut milk and 1 Cup of almond milk and bring to a boil. While you wait for the liquid to boil, whisk together the remaining 1 Tbsp of coconut milk, 1 Tbsp of almond milk and 1 1/2 Tbsp of tapioca starch in a small bowl, until smooth. 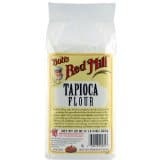 Once the milk mixture boils, whisk in the tapioca starch mixture, stirring constantly so it doesn't gum up in the milk and boil for 2 minutes, again stirring constantly. Reduce the heat to medium, add in the cream cheese ,salt, Thyme, nutmeg, pepper and chopped roasted garlic, and cook the sauce for an additional 5-6 minutes until nice and thick and the cream cheese melts, stirring frequently. 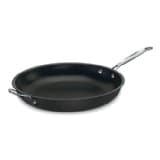 Cover the pan with tinfoil and place into the oven for 30 minutes. Uncover the pan, press the potatoes down so they really sink into the sauce, and then sprinkle the pecans over top. Cooke an additional 30-40 minutes, until the potatoes are fork tender and the top if browned. OPTIONAL: Turn your oven to high broil and broil the potatoes for 3-4 minutes to darken the top. Let the potatoes stand for 10 minutes, sprinkle with more Thyme and then DEVOUR. 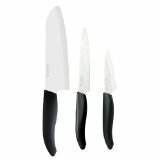 * I used my mandolin to slice the potatoes, and it was so much easier than using a knife! You can also use 2 lbs of one kind of potato. ** If you want to serve this in a casserole dish, just layer half the potatoes in a lightly greased casserole dish, pour half the thickened sauce over and then repeat! You just made my side dish of my dreams!! Love the healthier spin on these taters!! Wow. Don’t get me wrong, I love the buttery, cheesy, and dairy packed recipes that associated with this time of year, however, after all the rich food I crave something healthy. This looks and sounds amazing. I’m pinning this for later! Thanks for the slicing tip! Now I know I need to use a vegetable slicer! 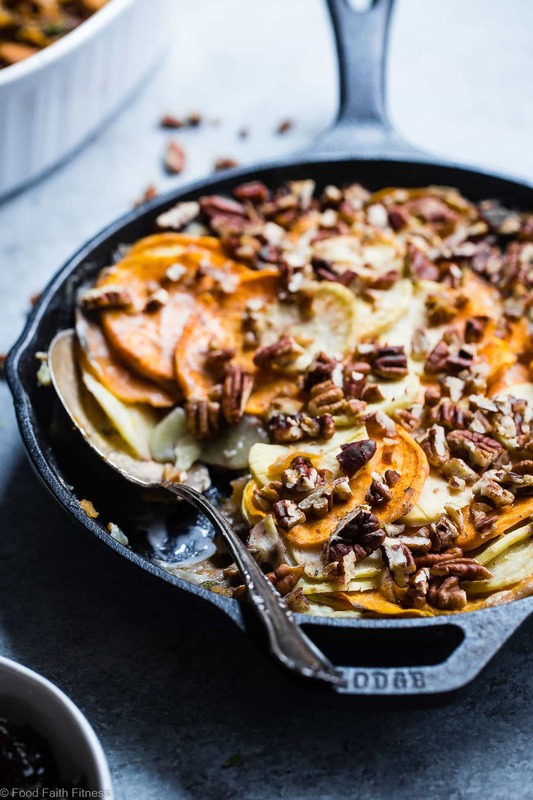 These scalloped sweet potatoes look absolutely to die for! I am thrilled this recipe is vegan too! Now I can make them to share with my besties! Hooray! Oh my goodness these look incredible! Such a delicious take on a classic side dish! Oh Gurrrrlllll! Saw these on IG yesterday and was in love at first sight. Deeeee-lish. We don’t have thanksgiving in the UK, but being Canadian too, I’m gonna import it and have these as the star. Or possibly I’ll just make them and have them while sitting on the sofa with some Netflix. Either way… they’re gorgeous.